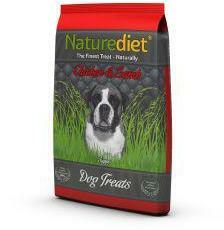 Naturediet Chicken and Lamb treats for dogs are made with freshly prepared chicken using only the highest quality natural ingredients, Naturediet Chicken and Lamb treats are a complimentary semi-moist treat which is highly palatable. Naturediet Chicken & Lamb treats are formulated without wheat gluten. Our vegetables are carrots. Ideal treat for training Containing 65% meat. They are suitable for all ages and breeds.